Ask fellow campers about "Hinton RV Park" and nearby attractions. We stayed here for an overnight, it was small, nice and clean, well kept, level pull through and the man was very friendly and helpful! They still have the shuttle to the famous "Lambert's restaurant" for your fill of comfort food! It rained all night so there was a lot of standing water but we made it out. Easy in and out, we would stay here again. Oh, I almost forgot- BEST WiFi ever!! They did it RIGHT!! We camped at Hinton RV Park in a Travel Trailer. Go to Lambert's restaurant if you're hungry! Free shuttle! The office never let us know that the City posted a "must boil water" notice. We used it 2 days before we found out. They stuck a small note on the office door but we had no reason to go up there so we never saw it. We camped at Hinton RV Park in a Fifth Wheel. Easy on/off the interstate with minimal road noise. Sites were gravel and utilities were adequate and placed for convenience. No trees in our section but we prefer that. Office staff was friendly and escorted us to our site. Did not use the bathhouse, laundry, or their free WiFi. Verizon cell service worked great. Take a left out of the campground and Lambert's, home of the throwed roll, is located about a mile on the left. This campground is great for an overnight stop. We will stop here again if in the area. We camped at Hinton RV Park in a Fifth Wheel. Quick overnight stop. The park looked nice and the laundry area was clean. The bathrooms need some work. The person who checked us in was very nice and drove us to our spot. Would stay here overnight again. We camped at Hinton RV Park in a Motorhome. This is not a destination campground but is an excellent place to spend the night if traveling up or down I-55. 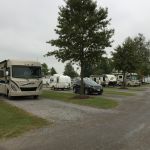 Easy access on and off the Interstate, with full hook ups, cable TV and the best Wifi we have ever had in a campground. All hook-ups were together and convenient. The staff is friendly and there is a gas station with diesel right next door. For what this is, a good place to spend the night after a long travel day, I have to give this an 8. We camped at Hinton RV Park in a Fifth Wheel. Stayed here for a week while doing some genealogical research. Park is actually in the city of Miner, just off I-55. Our site, 43, was very level and all provided services worked as advertised (W, S, E, CTv). Some road noise during the day, but no a problem at night. Verizon voice and data strength was excellent. We camped at Hinton RV Park in a Motorhome. If you are staying in the area or just passing through, include a meal at Lambert's Restaurant. We also enjoyed the Cheers Bar and Grill. Head south on I-55 and then west on US 60 to US 62 north, to access all the box stores in the Sikeston area. Very good overnight stop! Clean, level, and easy to find. Only one exit from Route 60 to Branson, which is a beautiful 4 lane divided highway all the way. We'll stop here again on our return trip because the staff was friendly and helpful! We camped at Hinton RV Park in a Motorhome. Lambert's Cafe is worth a visit and has free shuttle service to the campground. A lot more permanent campers have been added since my last stay here. The sites look clean, the campers okay- some old, one covered in foil all windows. Watched someone come out of obviously long term camper in front of office, carry his dog to site behind him and place down to poop in the grass there. Did not clean it up, carried dog back to own site. Still great place to pull off of I-55 or I-57 for night, easy in and out, gas station by park. All pull through sites, full hookup. Laundry was 2 washers that did not wring water out of clothes and 2 dryers that couldn't dry after so much water left in clothes. Bathrooms clean. We camped at Hinton RV Park in a Fifth Wheel. This is a no frills park but served our purpose. The pull through was long enough for our 45 ft motorhome and tow car. The office was very friendly. They had beautiful flowers up at the office area. They even had a van that will pick you up and take you to the Lambert's Cafe. That was such a fun experience. From there we went on to Branson MO and the road was not the best. There is a very long bridge that we had to cross and that was so narrow and we had a truck coming from the other direction and it was so close, I can't believe we didn't either hit the truck or hit the side of the bridge. We swore we would never go on that road again. We camped at Hinton RV Park in a Motorhome. This is a very handy and clean park just a mile off I-55. Staff is always friendly. Sites are level and decently spaced. They offer a shuttle to Lambert's Cafe if you don't want to unhook a tow car. We camped at Hinton RV Park in a Motorhome. Lambert's Cafe...home of the "thrower roll"...2 miles away. Nice place to over nite and close to Lambert's cafe. We camped at Hinton RV Park in a Fifth Wheel. This was a decent park right near the highway but quiet - office lady was very nice. Our site was level and all worked well. A lot of permanents but kept very tidy. The only improvement needed is the restrooms - only one toilet and one shower in the ladies room; the shower is pretty nasty made of cement blocks with years of scale buildup. We camped at Hinton RV Park in a Travel Trailer. Try Lambert's Cafe for a great meal - they even have a shuttle from the RV park! The lady at the registration desk was very friendly and helpful. The site was level and spacious. All the hookups worked well. The restrooms were clean. We were at first concerned that there might not be enough showers, but no one else seemed to be using them, so it worked out fine for us. We did not hear any traffic noise and the camp was very quiet. We would definitely return to this park. We camped at Hinton RV Park in a Travel Trailer. Level sites, very clean, easy to maneuver. Easy access from the interstate. Friendly staff. We camped at Hinton RV Park in a Motorhome. Visit Lambert's Cafe. Great food. Go hungry! A shuttle is provided if you do not want to unhook. Be aware of the NARROW two lane bridges over the MO and MS rivers if you are considering US 62/60 from Cairo to Puddach. Big! Big RV friendly with cable, wifi, level sites and easy access. Works for us. We camped at Hinton RV Park in a Motorhome. If you haven't been to Lambert's Cafe, you must go. Yes, they do throw rolls (to) at you. Careful where you walk, many of them wind up on the floor. We like Ruby Tuesday's and there is one nearby, but it isn't easy to find. From the park exit turn left and, just after you pass under the highway, turn into the Drury Inn parking lot. The restaurant is set back against the side of the highway overpass. The big attraction is Lambert's Restaurant. There's a shuttle from here to Lambert's. Highly recommend. We happened to take the shuttle over about 4:45 and we got right in on a Thursday. Other times it could be very busy especially once school is out. Lambert's (home of the throwed rolls) is very much worth a visit. Also, if you need mobile RV repair service, ask the front desk for Jimmy's phone number. He's very helpful and inexpensive. The campground has an arrangement with Lambert's "Home of Throwed Rolls" Restaurant. They will pick you up at the campground, take you to the restaurant, seat you immediately (so you don't have to wait in line) and return you to the campground when you are finished eating. The famous Lambert's "roll throwing" restaurant is two minutes away; good food, unique experience. Be sure and go to Lambert, home of the throwed rolls. Free shuttle from the campground. Just go to the office when you want to go eat. They come and get you in just a few minutes and you are seated at the restaurant right away (no waiting). Visit Lambert's Cafe, the home of the throwed rolls. Lambert's Throwed Rolls is just down the street. Quite the dining experience. Loved it. Any shopping or dining you want is close by and convenient. Lambert's Cafe offers a free shuttle (but always worth a tip!) Lambert's offers "down home cookin". Good leftovers to put in your fridge! The shuttle driver will get you seated right away, which is great if the restaurant is busy. We have gone there several times and never been disappointed. The food tourist attraction in Sikeston is Lambert's, where they throw rolls, but I had been there before. So I went to JD's Steakhouse; good food at reasonable prices. We had a slide issue while at the park and the manager recommended a mobile RV tech who was able to solve our problem. This in and of itself is a rarity, but a huge plus, that they were prepared to make such a recommendation. Go and eat at Lambert's cafe...call from the campground and they will come and get you. That's right folks Lambert's will send their van to come and drive you to the restaurant then walk you in, and seat you. Then they take you back to the campgrounds. Food is Awesome, staff is Awesome...Enjoy your meal! Near restaurants and fuel stations. Lambert's restaurant, Home of the Throwed Rolls, right down the street. A must go to place, at least once. Lots of good food. Lamberts "Throwed Rolls" is close by. OK, you're in Sikeston and so is "Lambert's Cafe" "Home of the Throwed Rolls". In fact it is about one half mile East of this RV Park on the same road. So what are you waiting for? You might as well go and see what all the fuss is about. It is pretty neat, the food is good, but the show is even better. They really do throw the rolls to you; even across the room. This is one of those restaurants that always has a line. Go early for dinner, but go anyway. There is shuttle service to and from Lambert's, a local restaurant that is home to the "throwed rolls". A must if you are in Sikeston. Not much in the area. We drove 25 miles south to see the small New Madrid Earthquake museum. You can call a shuttle to the area's main attraction, Lambert's Cafe. There is a wait for just walking in off the street, but when the shuttle takes you there, the driver takes you in by the back door and seats you at a table right away. We were in town for a HS reunion is why we stayed 6 days. We were not looking for amenities outside of FHUs and wifi so cable tv was a bonus. We never use bathrooms or laundry if we have FHUs so can not comment on that. Lambert's, one mile away, is a unique, family friendly restaurant, home of "thro'd rolls." You will not go away hungry. Reasonable prices. I walked over to the supposedly famous "home of the throw'd rolls (Lambert's?) and was not impressed. They charge a lot for what is commonly known as comfort food. 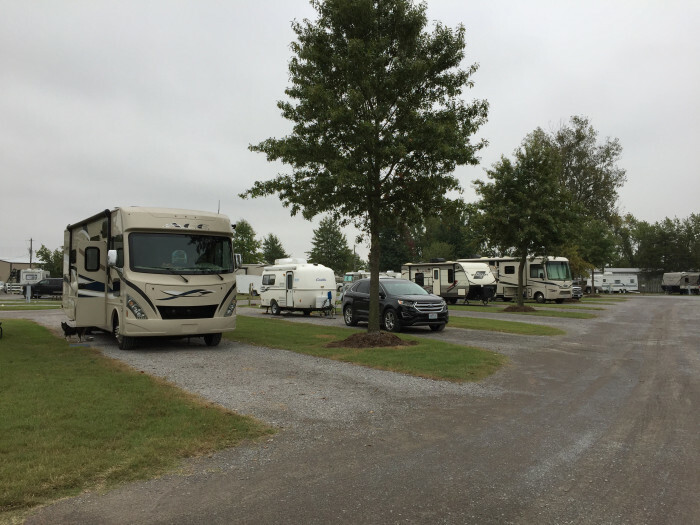 Are you affiliated with Hinton RV Park ?